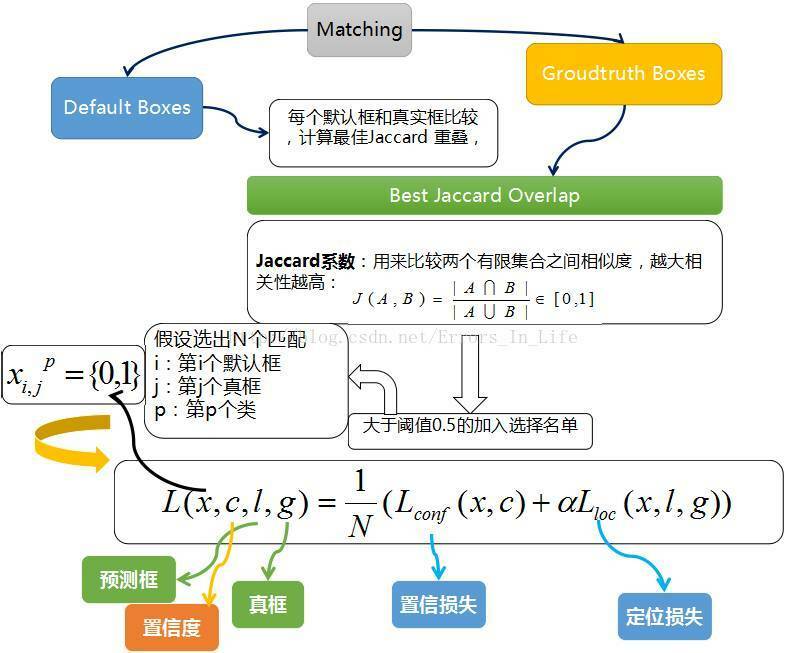 Matching strategy: Match default boxes to any ground truth with jaccard overlap higher than a threshold (0.5). This simpliﬁes the learning problem, allowing the network to predict high scores for multiple overlapping default boxes rather than requiring it to pick only the one with maximum overlap. The weight term α is set to 1 by cross validation. (1) Localization loss: The localization loss is a Smooth L1 loss  between the predicted box (l) and the ground truth box (g) parameters. (2) Conﬁdence loss: The conﬁdence loss is the softmax loss over multiple classes conﬁdences (c). Problem: Imbalance between the positive and negative training examples. Solution:Instead of using all the negative examples, we sort them using the highest conﬁdence loss for each default box and pick the top ones so that the ratio between the negatives and positives is at most 3:1. 优点：Faster optimization and a more stable training. Target: To make the model more robust to various input object sizes and shapes. – Use the entire original input image. – Sample a patch so that the minimum jaccard overlap with the objects is 0.1, 0.3, 0.5, 0.7, or 0.9. – Randomly sample a patch. After the aforementioned sampling step, each sampled patch is resized to ﬁxed size and is horizontally ﬂipped with probability of 0.5, in addition to applying some photo-metric distortions. (1) Data augmentation is crucial: We can improve 8.8% mAP with this sampling strategy. (2) More default box shapes is better: If we remove the boxes with 1/3 and 3 aspect ratios, the performance drops by 0.6%. By further removing the boxes with 1/2 and 2 aspect ratios, the performance drops another 2.1%. Using a variety of default box shapes seems to make the task of predicting boxes easier for the network. (3) Atrous is faster: We used the atrous version of a subsampled VGG16, following DeepLab-LargeFOV. If we use the full VGG16, keeping pool5 with 22 s2 and not subsampling parameters from fc6 and fc7, and add conv5 3 for prediction, the result is about the same while the speed is about 20% slower. (4) Multiple output layers at different resolutions is better: A major contribution of SSD is using default boxes of different scales on different output layers. To measure the advantage gained, we progressively remove layers and compare results. For a fair comparison, every time we remove a layer, we adjust the default box tiling to keep the total number of boxes similar to the original (8732). Table 3 shows a decrease in accuracy with fewer layers, dropping monotonically from 74.3 to 62.4. (5) Data Augmentation for Small Object Accuracy: The random crops generated by the strategy can be thought of as a ”zoom in” operation and can generate many larger training examples. To implement a ”zoom out” operation that creates more small training examples, we ﬁrst randomly place an image on a canvas of 16 of the original image size ﬁlled with mean values before we do any random crop operation. Because we have more training images by introducing this new ”expansion” data augmentation trick, we have to double the training iterations. We have seen a consistent increase of 2%-3% mAP across multiple datasets, as shown in Table 6. (6) Non-maximum suppression (nms): Considering the large number of boxes generated from our method, it is essential to perform non-maximum suppression (nms) efﬁciently during inference. By using a conﬁdence threshold of 0.01, we can ﬁlter out most boxes.We then apply nms with jaccard overlap of 0.45 per class and keep the top 200 detections per image.